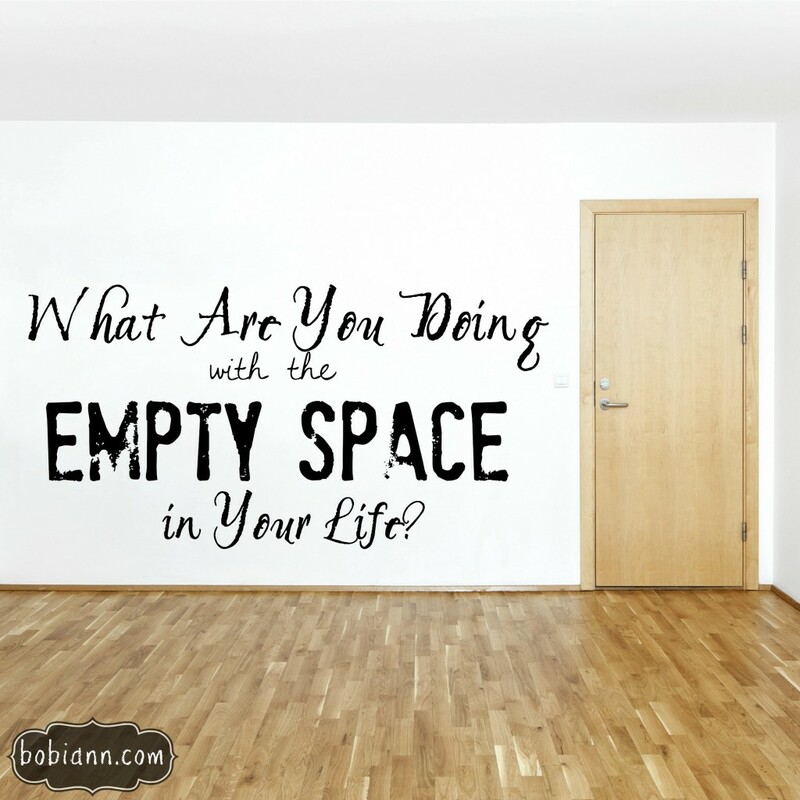 What Are You Doing With the Empty Spaces in Your Life? I don’t even know how to introduce this post. I’ve sat in tears reading it because of the woman who so bravely wrote it. Kari Long is one of my dearest friends in all the world. Kari’s story is one of redemption and hope. I am so honored to do ministry alongside Kari. You can read another guest post by Kari here. Be sure to check Kari’s blog here. There are countless resources on how to build a lasting marriage. There are books on boundaries, how to “affair proof” your marriage… How to build walls around your marriage to keep temptation out. Those are all good things. The problem is, none of those things really help you with your greatest threat- what lies inside those walls. You. Your heart. Your past. Your hurts. Your unmet expectations. The fact is, you cannot build walls to protect you from yourself. I recently shared the story of how God redeemed and restored my life after my first marriage ended. You can read more about that here. In the wake of sharing my story publicly, I had many people ask “Were there warning signs that you were headed for trouble in your marriage?” And I knew the answer must be YES, but honestly, I did not know what they were. So I prayed over it. I asked God to show me what I had missed… The red flags, the danger signals… And as I prayed, God showed me that the warning signs were not really outward signs. They were internal signs- things going on in my own heart that made me vulnerable to deception. Deception can come at us in many forms. But the things that make us vulnerable to the lies of the Enemy are actually pretty consistent. Those areas of vulnerability are simply empty spaces. Empty spaces that we have not yet allowed God to fill with Himself. God showed me some of the empty spaces in my heart that gave the Enemy room to work. Past sin– I had sin patterns in my past that I had never “felt” forgiven for. I let that guilt and shame permeate my relationship with God in a way that made it impossible for me to believe He was for me. I also had an Enemy whispering to me “You will never be clean.” That was a lie, but I bought it. Disillusionment– I realized about 3 weeks into my first marriage that it was not all it was cracked up to be. Imagine that. Where was the fairy tale ending? Where was the knight in shining armor? Where were all the castle servants? Not in my 900 square foot apartment… That disillusionment became a deep discontent that created even more emptiness in my heart. Distraction– I found other things to fill up the growing emptiness. Good things. Things like motherhood. Friendships. Church work. All helping me to avoid the growing emptiness in my heart, and the growing distance in my marriage. Lack of emotional connection– I knew in my heart there was something fundamentally wrong in my marriage relationship. I just didn’t know what or why. Maybe we were emotionally incompatible… Maybe this was as good as it gets… Maybe it was just me. I felt guilty for my feelings and thought maybe it was punishment for my past sins. Pretending– I felt that I could not tell anyone how empty I felt. My friends all had such seemingly perfect marriages… how would they ever understand? And my false belief that somehow God was not on my side kept me from running to Him with the growing distance in my marriage. The emptiness was growing and threatening to consume me. All the while I smiled and pretended I was ok, when in reality, I felt completely and utterly alone. Isolation– I began pulling away from everyone who might dare to see through my mask. Even my very closest friends knew something was wrong, but not what… And I wouldn’t have known how to express it to them anyway. I was walking around bleeding to death and no one could see it. I longed for someone to truly see me, to see behind my mask. At the same time, I was terrified of what anyone would think if they knew what was really going on in my heart. That isolation cut me off from those who could have spoken truth into my life. And opened the door wide to the lies of the Enemy. Any temptation we face is simply an empty space that we are trying to fill up. For every real need you have, you have an Enemy ready with a solution that looks, tastes, and feels like exactly what you need. All of those empty spaces I was walking around with were just an open invitation for the enemy to work. He knew exactly what they were and had a lie that looked a lot like the truth to offer me for every single one. I had not yet learned to take my needs and my longings to God. I knew how to check off all the boxes. I had quiet times. I did bible study. I prayed. I worshipped. I did ALL THE THINGS. But I did it all under the pretense that I was ok. I was even pretending with God. Satan tempts us to defeat us. God allows it so that we will learn to run to Him to meet our needs. He can fill the empty spaces. In fact, He longs to fill your empty spaces. No matter what they are or how big they are. Anything we try to fill our emptiness with that is not from God is designed for our destruction and to damage the kingdom of God. You have a target on your backs. The stakes are high. But the battle plan is simple. Take off the mask. Run to Him. Question: The tactics the Enemy uses are tailor made for our weaknesses. What empty spaces do you have that you have not yet allowed God to fill? Incredible post! Insightful and definitely captures how the enemy seeks to destroy us. I know this precious child of God. I knew her before her first marriage ended and I know her today…I can tell you one thing for sure. God’s hand on her life has NEVER left. Even when she was at her darkest moment (internally) His light shined through her. I am so thankful for the CONFIDENCE in Christ and the ability to share so that others may grow. Love you Kari! !